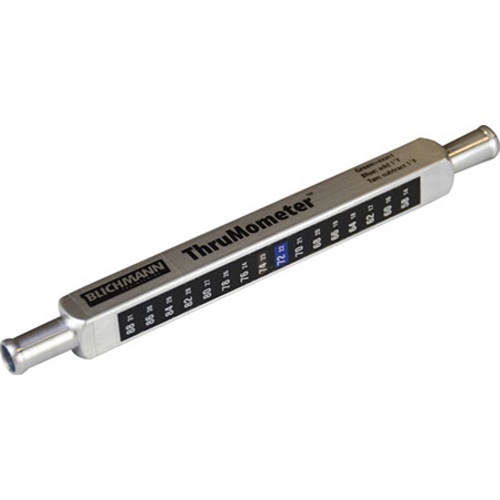 The Blichmann ThruMometer In-line Thermometer is a great way to know the temperature of your wort while it's being transferred. Very helpful when using a counterflow or plate chiller to read the temperature of your wort going into the fermenter. Made of heat-treated highly corrosion resistant aluminum. Reads from 58°F - 88°F, and has 1/2" in and out posts. Need quick temp. from plate chiller to fermenter. When used with an adjustable ball valve -- it makes dialing in the temp coming from the plate chiller a breeze. I needed something to check the temperature of my wort after using the counterflow chiller. This is an extremely accurate and very fast acting thermometer that is a perfect instrument to use on the outflow of the Blichman wort chiller. It's extremely easy to clean. It's not electronic so it never needs new batteries. I use this to monitor temperature of wort leaving the chiller to the fermenter. I compared it with two other thermometers I normally use and found this one to be spot on and easy to read. Simple to clean too. Use this to monitor the wort temp coming out of a plate chiller. Easy to clean and set up. Its also conveniently an end weight on the hose, helps hold it in place. The temp updates quick.